If you could see my office, you'd laugh at this next statement, but I'd really like all my stuff nicely organized. Of course that would start with my business stuff, but I already have ways to organize this, if I could just muster the discipline. But with two kids now, I am feeling more and more guilt that I don't keep up on their scrapbooks (and by 'keep up,' I'm leaving off the fact that his isn't started, and hers is done through three-months old...but she's four YEARS old now). This craft storage center is AWESOME. 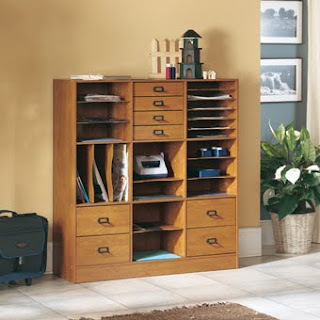 Can't you just picture it with scrapbook paper in those big slots, photos sorted in the drawers, and a simple folding table nearby so I can work with it all in reach? Hey, a girl can dream, right?